That’s what LeBron James tweeted shortly after UConn ran rampant all over John Calipari’s Kentucky Wildcats in the NCAA Title Game. All respect to James, who certainly knows basketball better than the average layman, but while Shabazz Napier might have played himself into a late-first (think the 25th pick or so) with his ace play in this tournament, he absolutely will not be the first point guard drafted in the 2014 draft. “This is what happens when you ban us,” Napier told CBS (and everyone tuning in) after the game. “Two years and hungry, [we’re] the Hungry Huskies.” The broadcaster terror was palpable. The fiscal relationship between CBS and the NCAA is not one to be trifled with likely, especially when it’s coming from a player who’s never going to be held answerable to that governing body again. For one thing, Napier’s already a senior. As someone like LeBron James — who was drafted straight out of high school — should know, most great NBA prospects don’t play four years of college ball. For every Tim Duncan, who famously promised his mother he would finish his education and earn his degree, there are a dozen others who played for all four years because the NBA wasn’t interested. Teams are as interested in potential as they are results, and an undersized soon to be 23-year-old has a much higher chance of being the next Nolan Smith than the next Damian Lillard. Who is Nolan Smith? Exactly. Napier’s not going in the lottery, and he’s certainly not going before these two point guards: Dante Exum and Marcus Smart. Smart, you’ll recall, was the player who returned to Oklahoma State instead of declaring for the 2013 Draft. We’ve already highlighted the ways that he hurt his draft stock, but there’s absolutely no way he’s going to be picked after Napier. None. Never. We will gladly bet LeBron a whole silver dollar (plus shipping and handling) that this is the case. Even after the disappointing season, the fan shoving, and all the other draft-damaging activities, Smart’s not slipping past the No. 10 spot, and he’s not going to be the first point guard drafted, either. Back in February, we looked at Dante Exum as part of our “Top 10 Draft Prospects“ midseason series. Back then, Exum was known for his incredible 2013 Nike Hoops Summit performance (we’ve linked the YouTube video below.) Now he’s known for telling Bleacher Report he’d like to play for the Lakers and for his scarcity of footage. The complete hoops summit game is below — it features many of the top draft picks for this upcoming draft, so if you’re jonsing for some more basketball before the playoffs, check it out. Dante Exum is almost five years younger than Shabazz Napier and five inches taller. That’s the kind of thing that an NBA front office has to measure when they’re looking into which rookie they can lock into the most team friendly contract in the National Basketball Association. The rookie deal is the best deal for the team, because it comes with a team option and it’s astonishingly budget friendly. The reason the trade deadline was so quiet this year — and every year so far — under the new (2012) collective bargaining agreement is because front offices are valuing first-round picks more highly than gold. First round picks used to be throwaways — in fact, the league had to implement a rule to keep teams from trading too many of them. Chris Webber was traded for 3 first round picks and Penny Hardaway in 1993. There’s no way that swap happens today. Not even the Knicks would be swindled like that anymore, especially not now that they have Phil Jackson. So, when a team’s coming up on a mid-to-late lottery pick (No. 7 – No. 15), and they’re looking at an undersized 23-year-old or a similarly skilled 18-year-old who’s above average in height for the position, the 18-year-old is going to win every time. After the rookie contract expires, the 18-year-old is going to be 22 with another decade of high-level NBA basketball in their future, assuming health. The 23-year-old is going to be 27 — closing in on the 30 gap, and well past it after the second contract expires. Napier’s probably played his way onto an NBA team, but he won’t be going in the lottery. In fact, we can already guess the rough form of how the lotto’s going to break down. The top three prospects in the NBA Draft pool, assuming Duke’s Jabari Parker declares, are him, along with Kansas’ Andrew Wiggins and Joel Embiid (who has not technically declared but is widely expected to.) That’s the trio that’ll make up the top picks, assuming they all wind up in the draft. Parker’s the best scorer, Wiggins has the ceiling of a healthy Tracy McGrady, and Embiid is too enticing a prospect to fall lower than fourth. 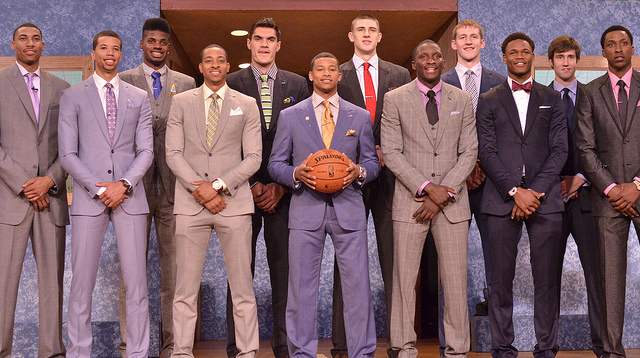 Then there’s Exum — 6’6? hyper athletic point guards don’t come along often, but when they do, they’re snagged up very quick (think the healthy, young Penny Hardaway.) If one of the top three teams gets scared of Embiid’s injury history or if Parker doesn’t declare, he could easily hop into the top three. That’s the upper tier of talent in the 2014 draft: Embiid, Exum, Parker, and Wiggins. Right underneath them are Smart, Kentucky power forward Julius Randle, Arizona small foward Aaron Gordon, and Indiana power forward Noah Vonleh. Those, in some order, are going to be picks No. 5 – No. 8. After that, you’re looking at guys with visible drawbacks like Doug McDermott, Willy Cauley-Stein, Tyler Ennis, and foreign prospects like Dario Saric and Jusuf Nurkick. None of those guys are Shabazz Napier. Also, this is a hilarious bit of satire that needs to be seen if you’re at all interested in the NBA.